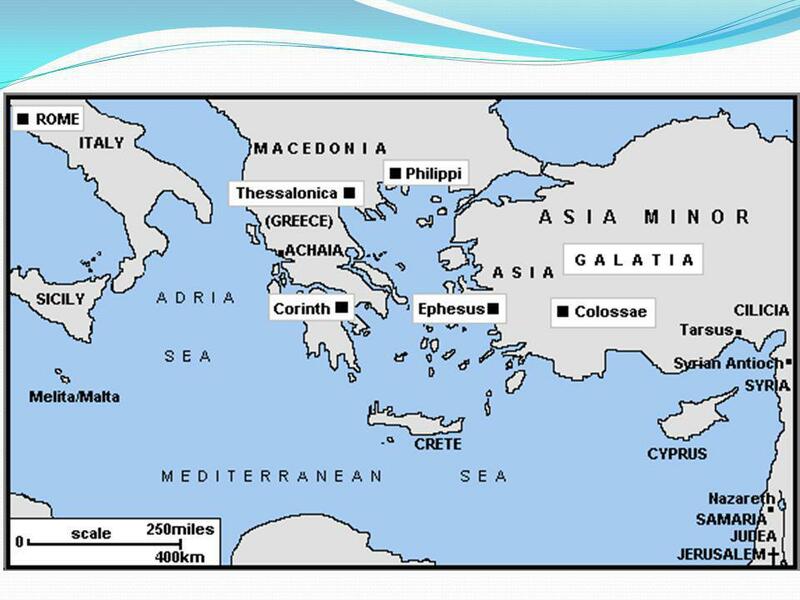 Acts 19. 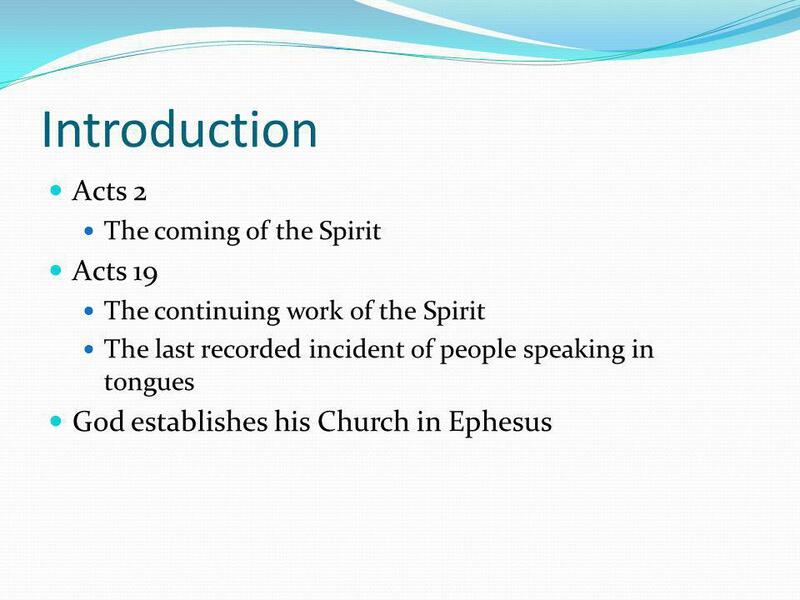 Introduction Acts 2 The coming of the Spirit Acts 19 The continuing work of the Spirit The last recorded incident of people speaking in tongues. 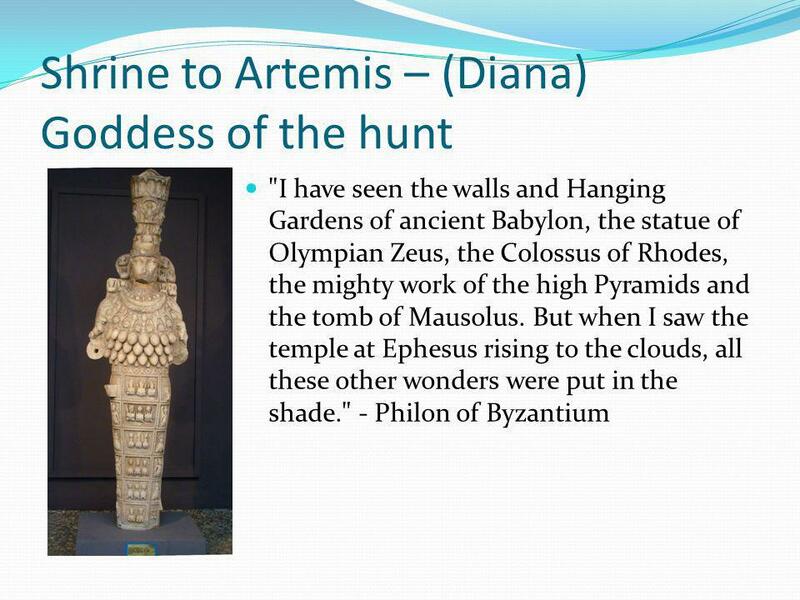 7 Ephesus (Cont.) 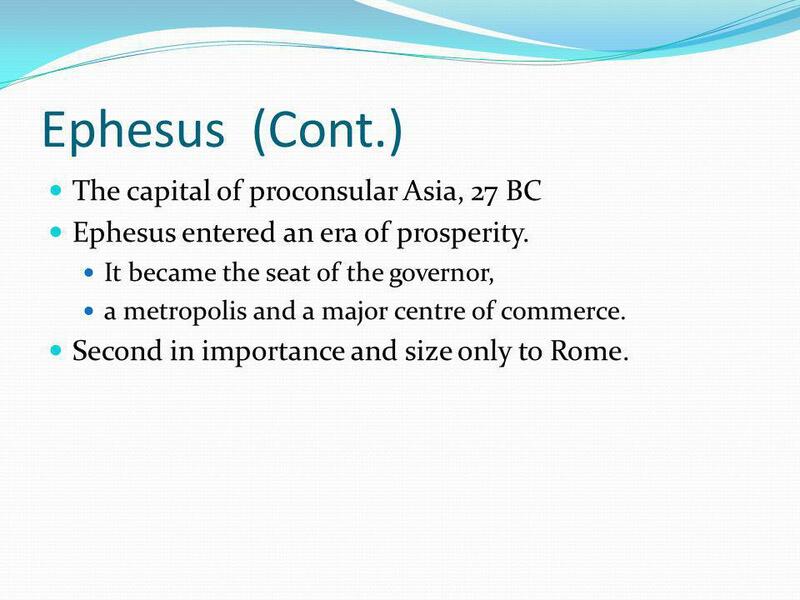 The capital of proconsular Asia, 27 BC Ephesus entered an era of prosperity. 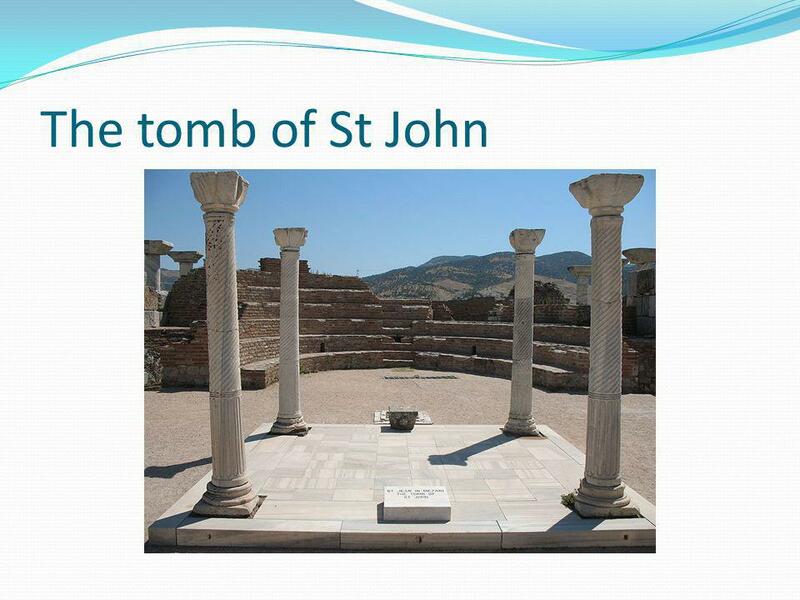 It became the seat of the governor, a metropolis and a major centre of commerce. 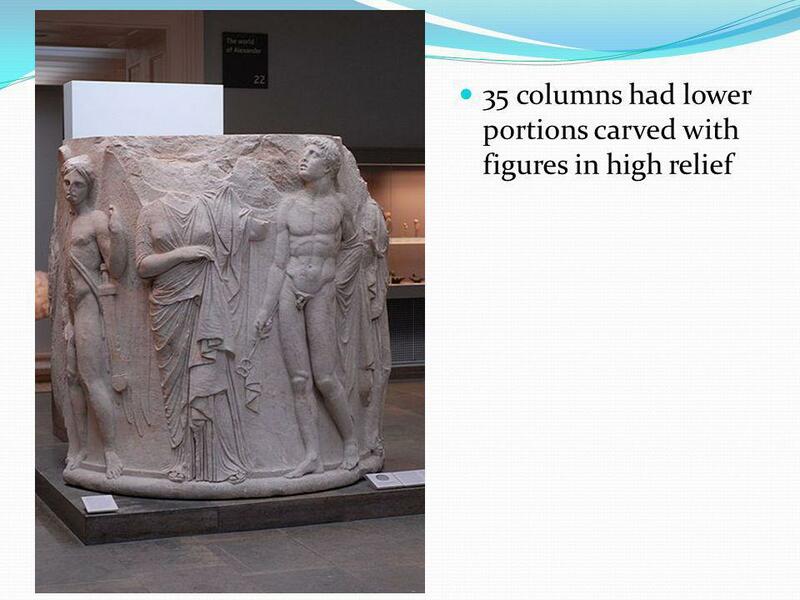 Second in importance and size only to Rome. 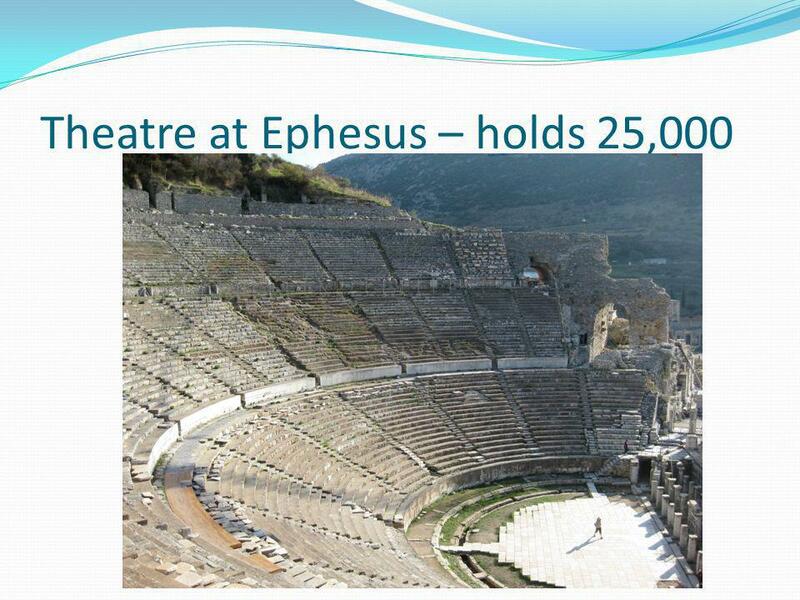 10 Ephesus (Cont.) 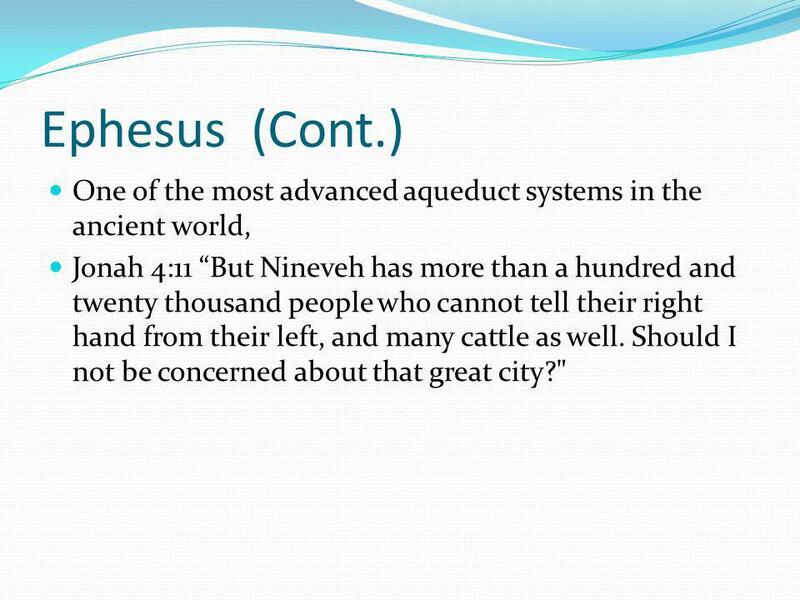 One of the most advanced aqueduct systems in the ancient world, Jonah 4:11 But Nineveh has more than a hundred and twenty thousand people who cannot tell their right hand from their left, and many cattle as well. Should I not be concerned about that great city?" 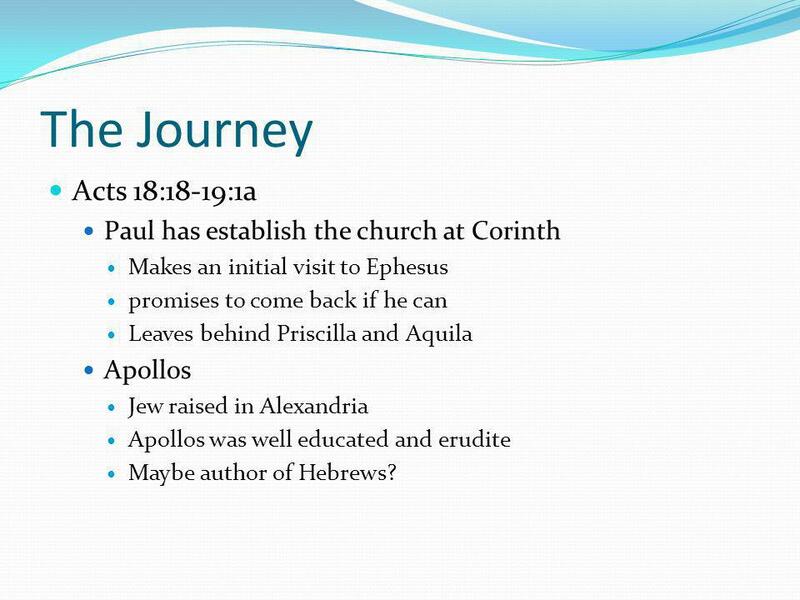 11 The Journey Acts 18:18-19:1a Paul has establish the church at Corinth Makes an initial visit to Ephesus promises to come back if he can Leaves behind Priscilla and Aquila Apollos Jew raised in Alexandria Apollos was well educated and erudite Maybe author of Hebrews? 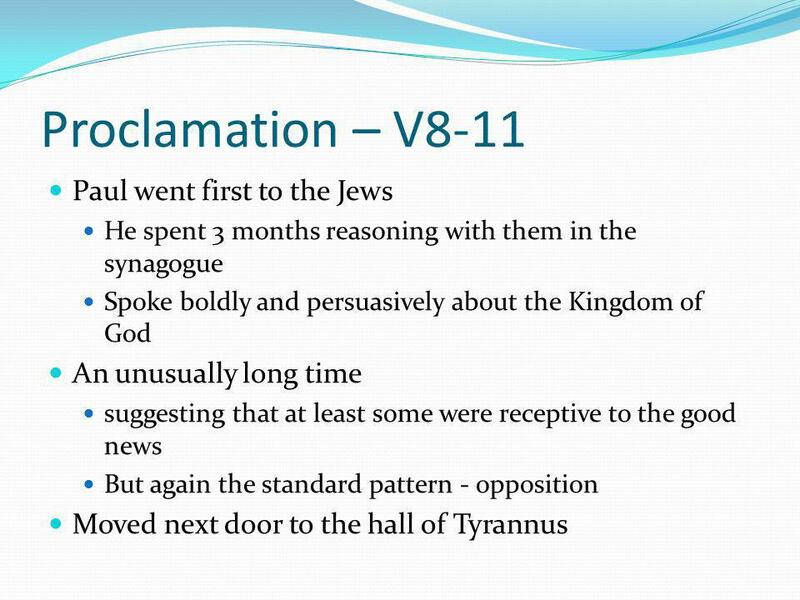 18 Proclamation (Cont.) 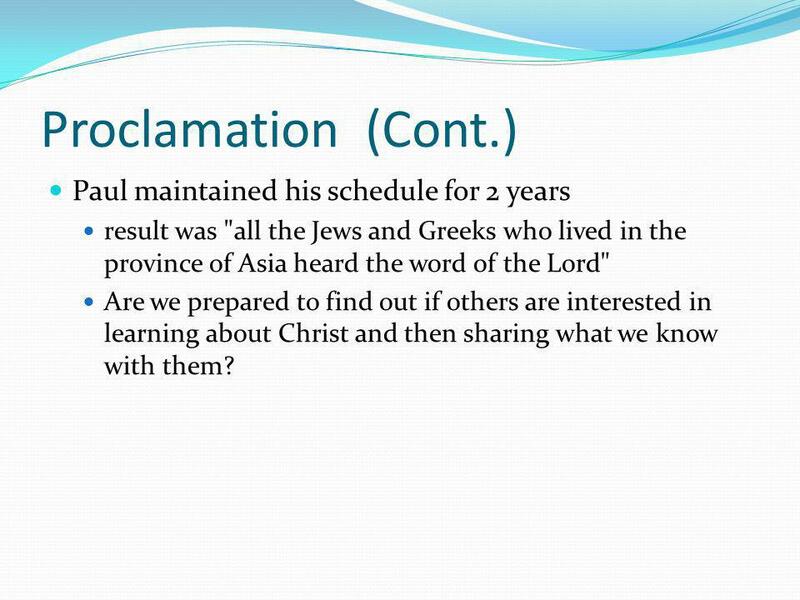 Paul maintained his schedule for 2 years result was "all the Jews and Greeks who lived in the province of Asia heard the word of the Lord" Are we prepared to find out if others are interested in learning about Christ and then sharing what we know with them? 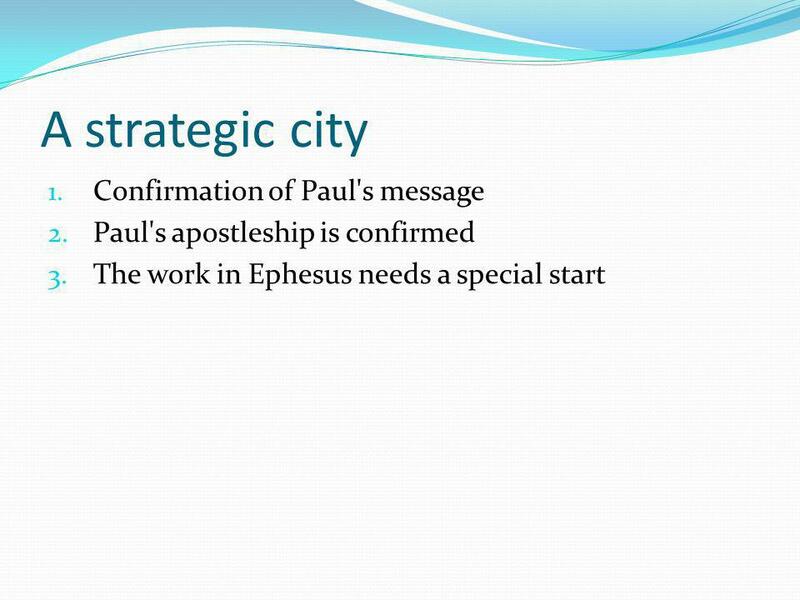 20 Confirmation (Cont.) 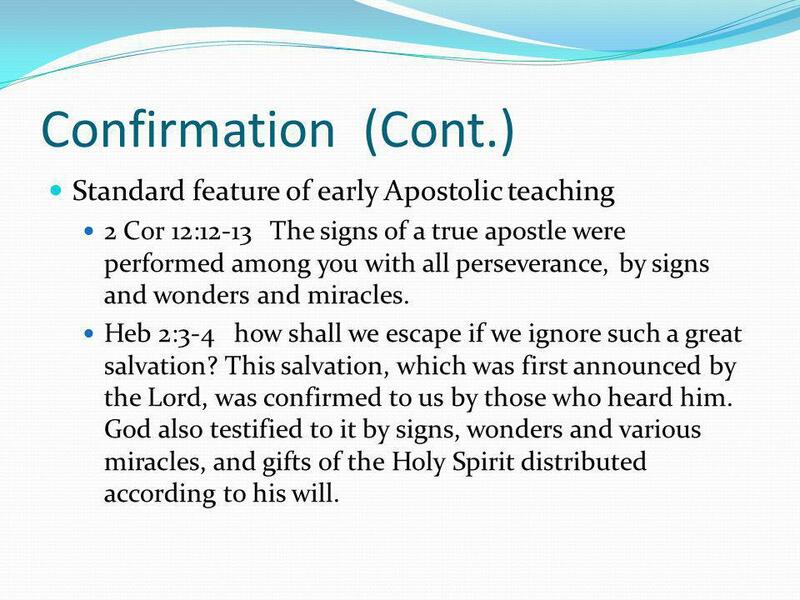 Standard feature of early Apostolic teaching 2 Cor 12:12-13 The signs of a true apostle were performed among you with all perseverance, by signs and wonders and miracles. 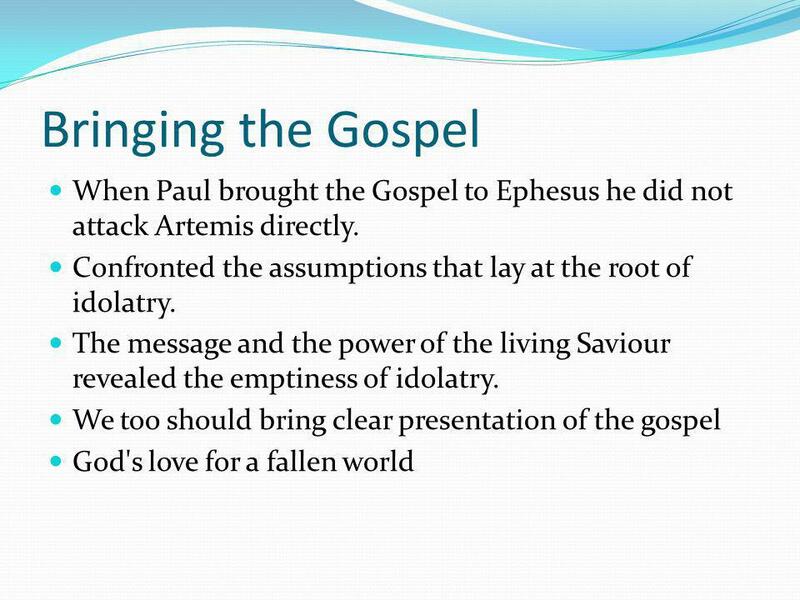 Heb 2:3-4 how shall we escape if we ignore such a great salvation? This salvation, which was first announced by the Lord, was confirmed to us by those who heard him. God also testified to it by signs, wonders and various miracles, and gifts of the Holy Spirit distributed according to his will. 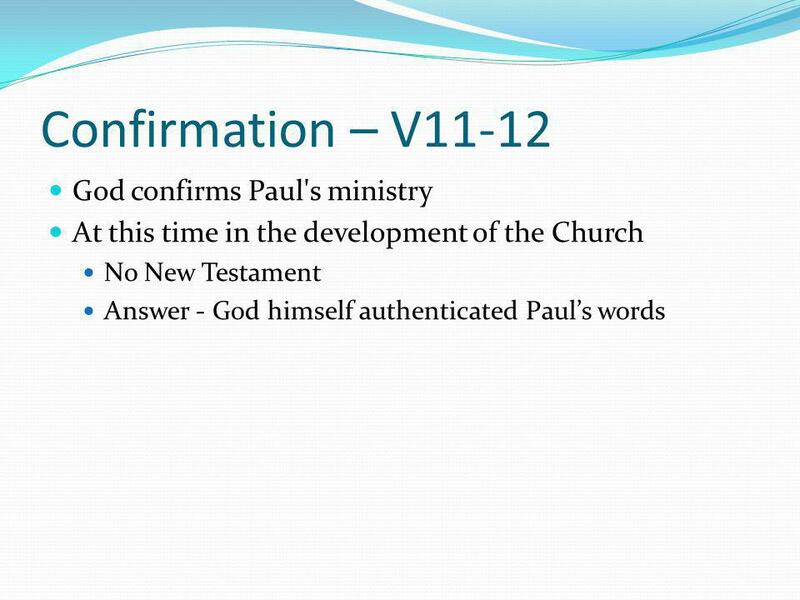 21 Confirmation (Cont.) Matt 9:20-21 Just then a woman who had been subject to bleeding for twelve years came up behind him and touched the edge of his cloak. She said to herself, "If I only touch his cloak, I will be healed." 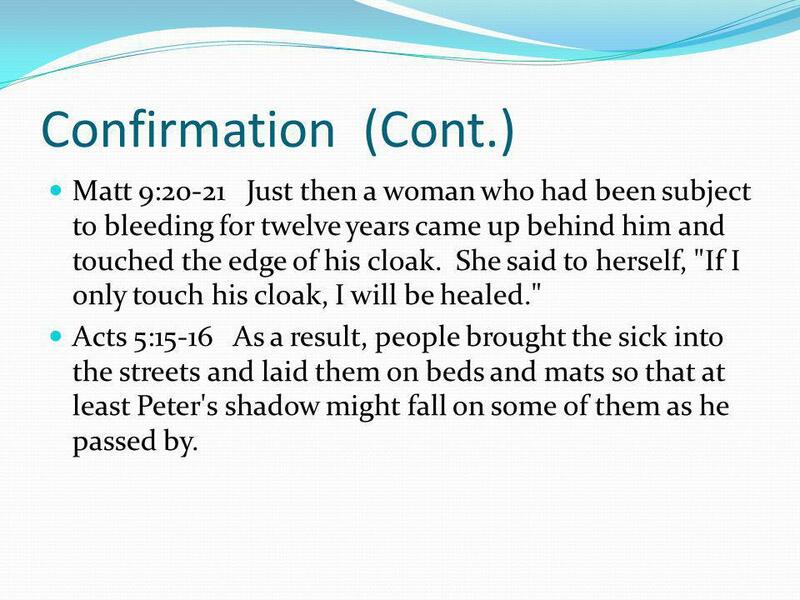 Acts 5:15-16 As a result, people brought the sick into the streets and laid them on beds and mats so that at least Peter's shadow might fall on some of them as he passed by. 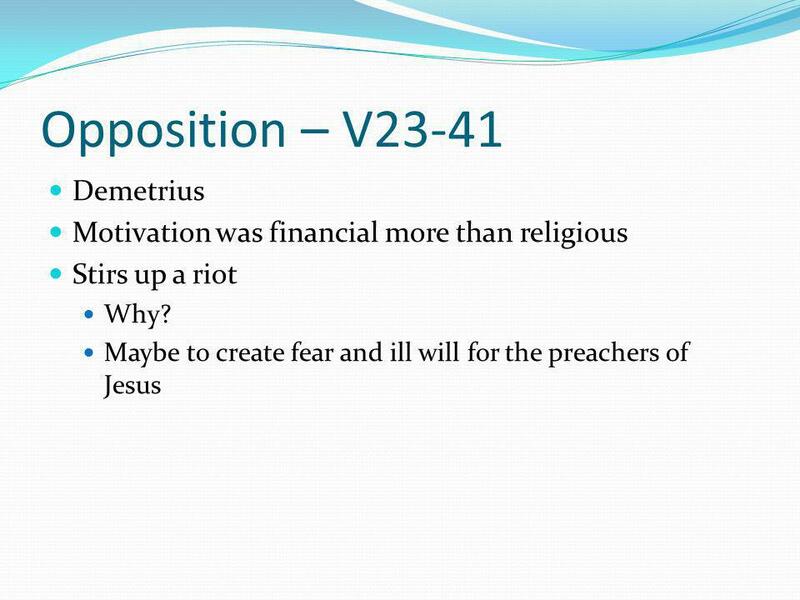 22 Confirmation (Cont.) 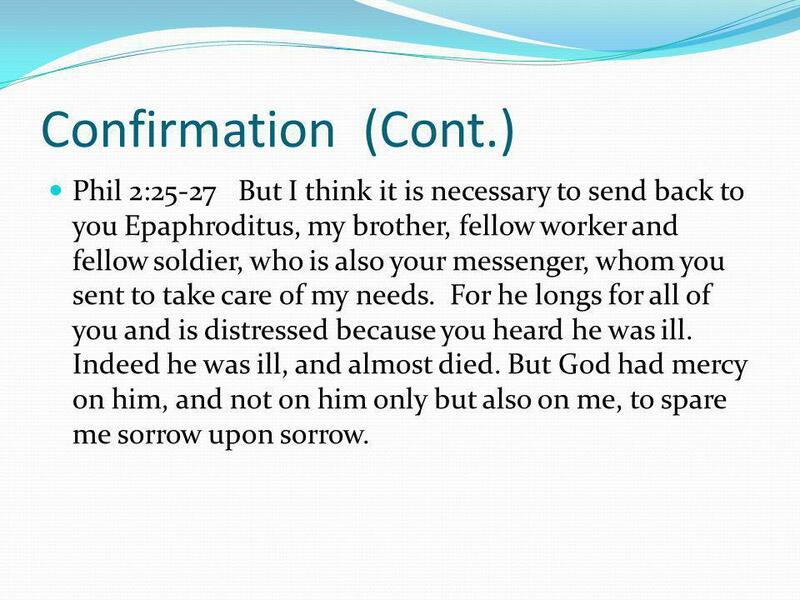 Phil 2:25-27 But I think it is necessary to send back to you Epaphroditus, my brother, fellow worker and fellow soldier, who is also your messenger, whom you sent to take care of my needs. For he longs for all of you and is distressed because you heard he was ill. Indeed he was ill, and almost died. But God had mercy on him, and not on him only but also on me, to spare me sorrow upon sorrow. 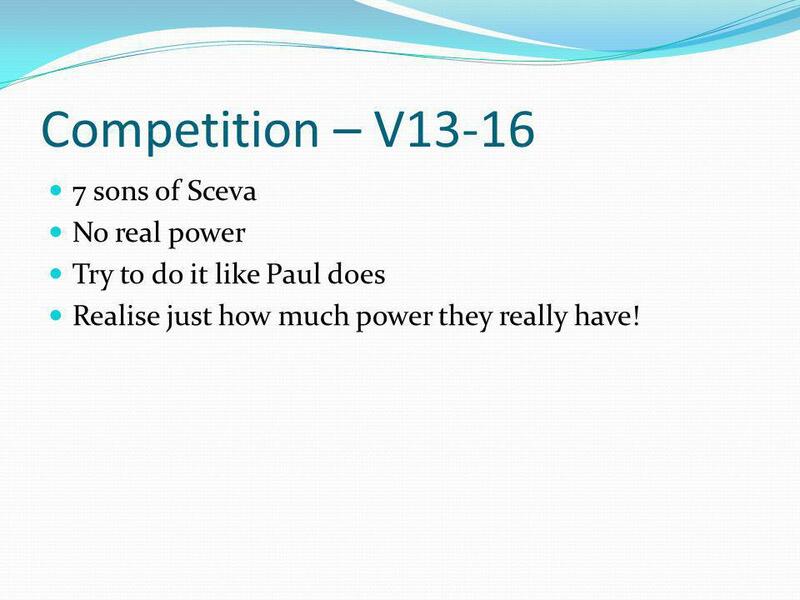 23 Competition – V13-16 7 sons of Sceva No real power Try to do it like Paul does Realise just how much power they really have! 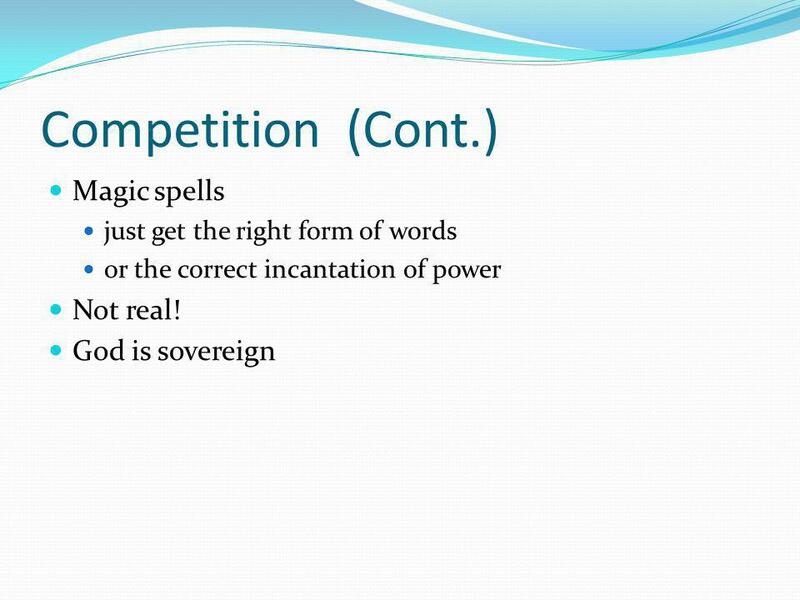 25 Competition (Cont.) 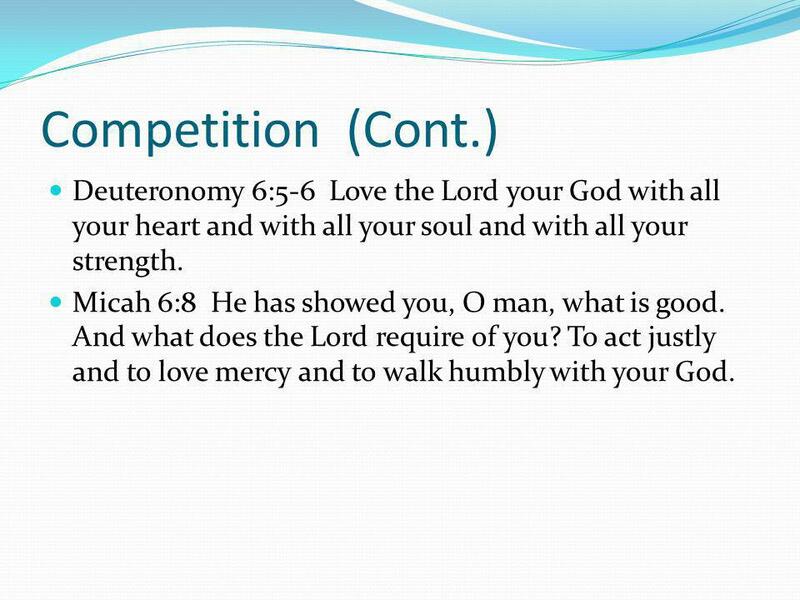 Deuteronomy 6:5-6 Love the Lord your God with all your heart and with all your soul and with all your strength. Micah 6:8 He has showed you, O man, what is good. And what does the Lord require of you? To act justly and to love mercy and to walk humbly with your God. 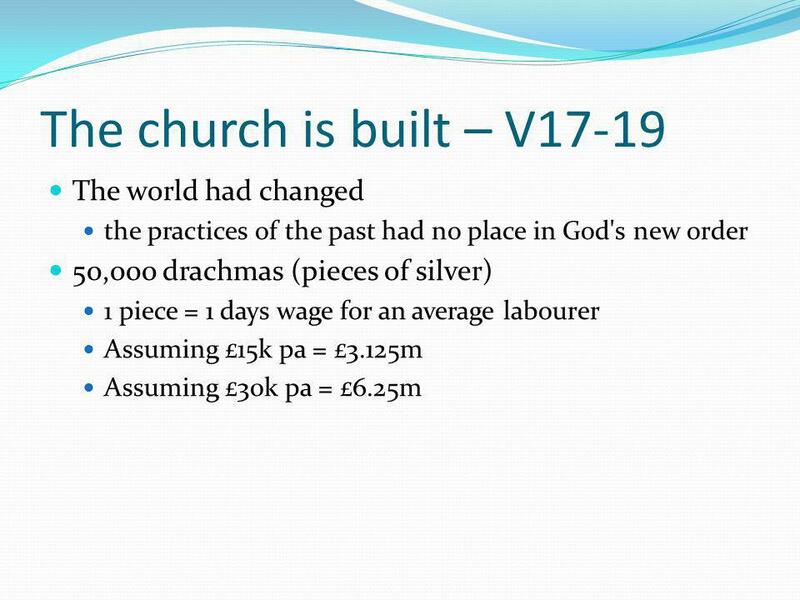 27 The church is built (Cont.) 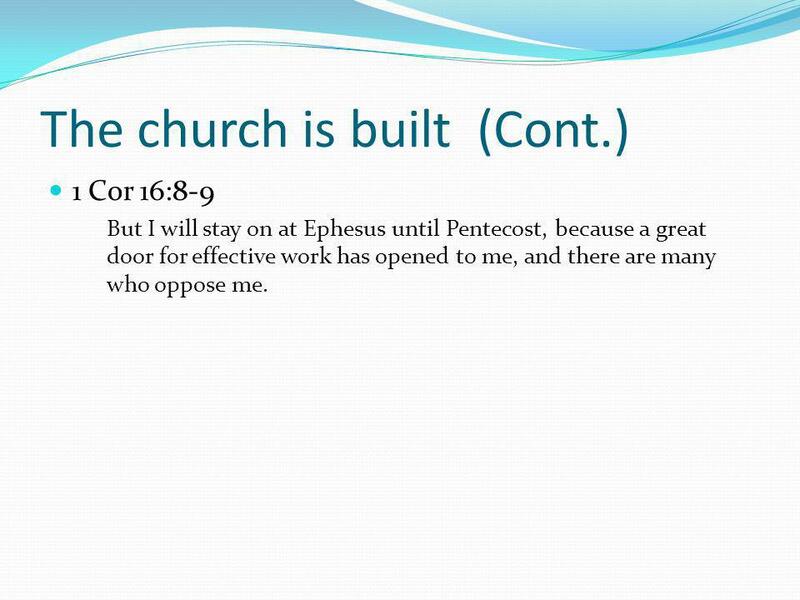 1 Cor 16:8-9 But I will stay on at Ephesus until Pentecost, because a great door for effective work has opened to me, and there are many who oppose me. 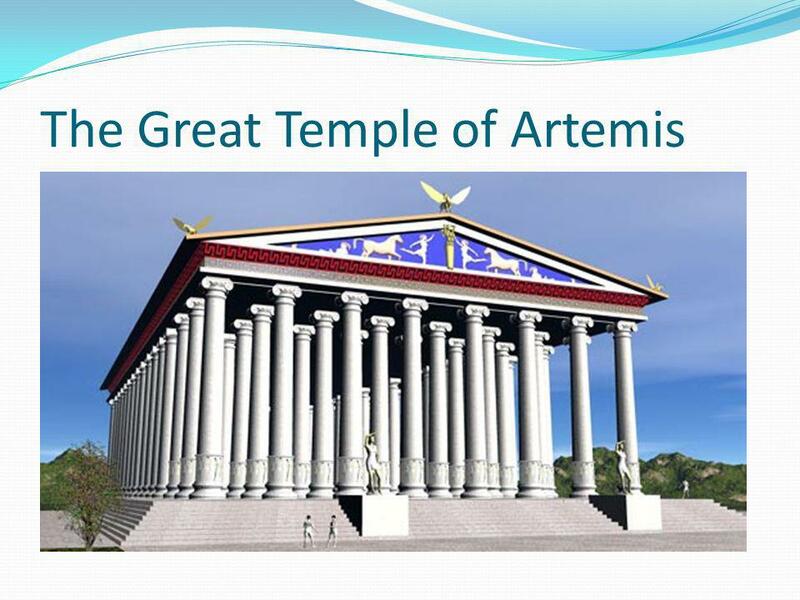 30 Endings Great Temple of Artemis was destroyed during a raid by the Goths in 268 A.D. 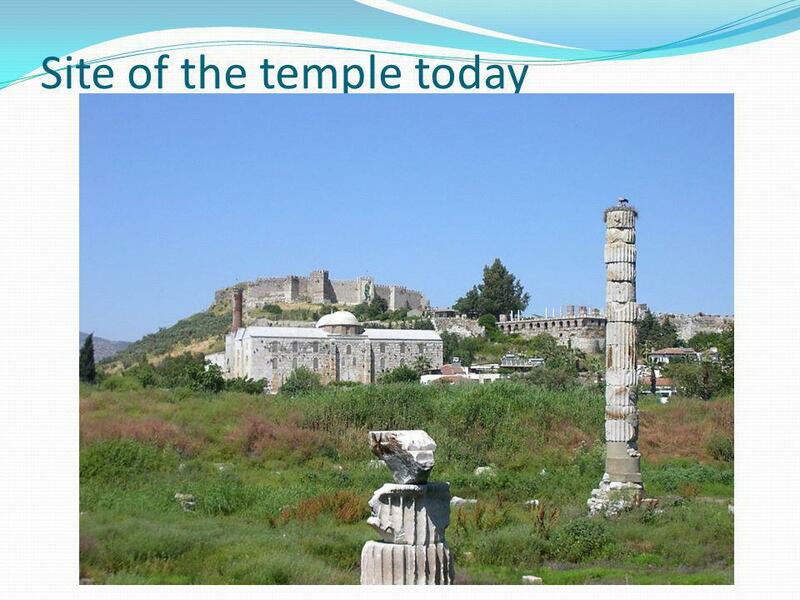 The temple was rebuilt again, but in 391 it was closed by the Emperor Theodosius the Great after he made Christianity the state religion. 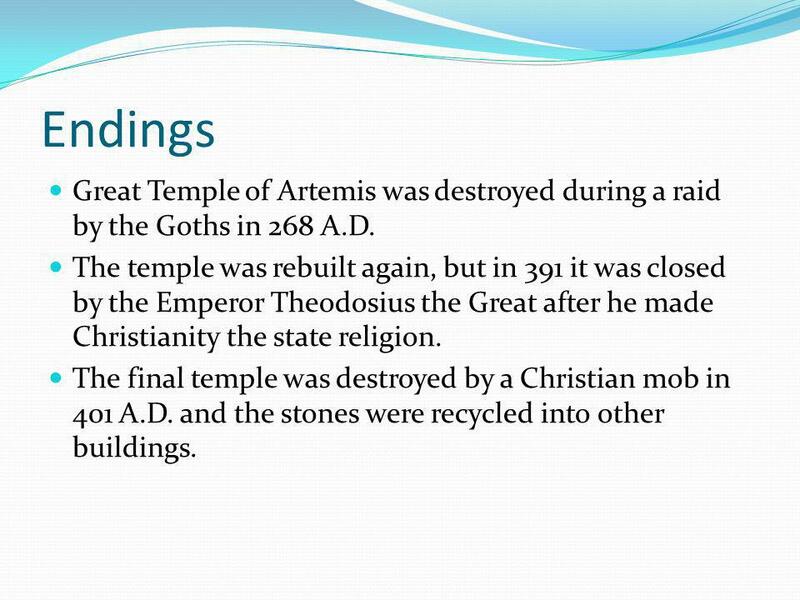 The final temple was destroyed by a Christian mob in 401 A.D. and the stones were recycled into other buildings. 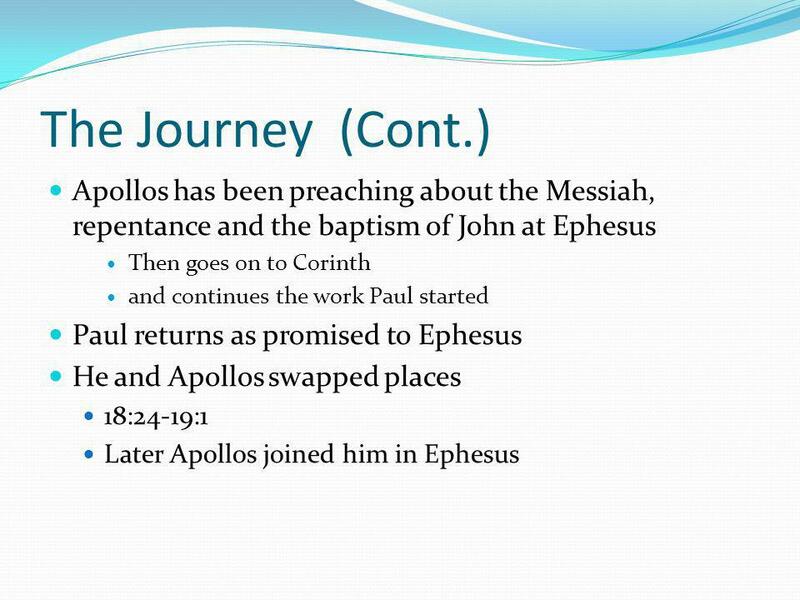 Download ppt "Acts 19. 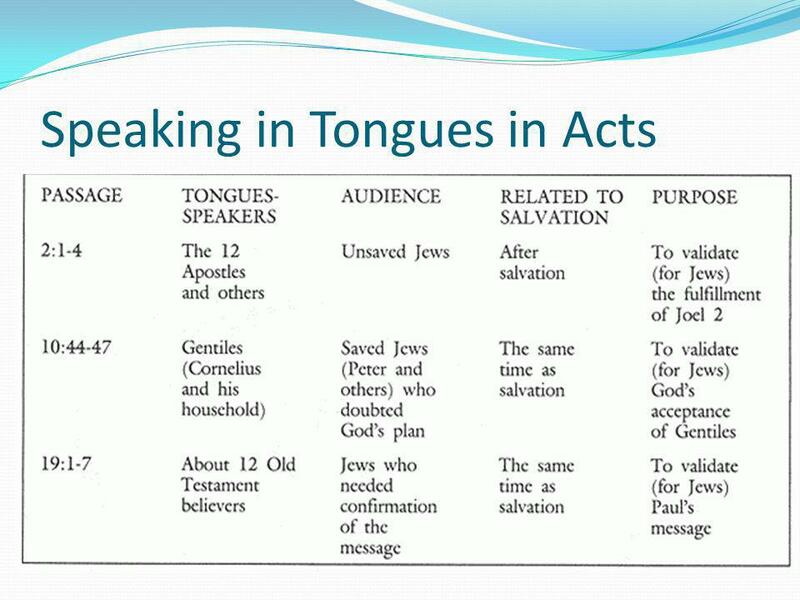 Introduction Acts 2 The coming of the Spirit Acts 19 The continuing work of the Spirit The last recorded incident of people speaking in tongues." He Is Not Here For He Has Risen Matthew Chapter 28. 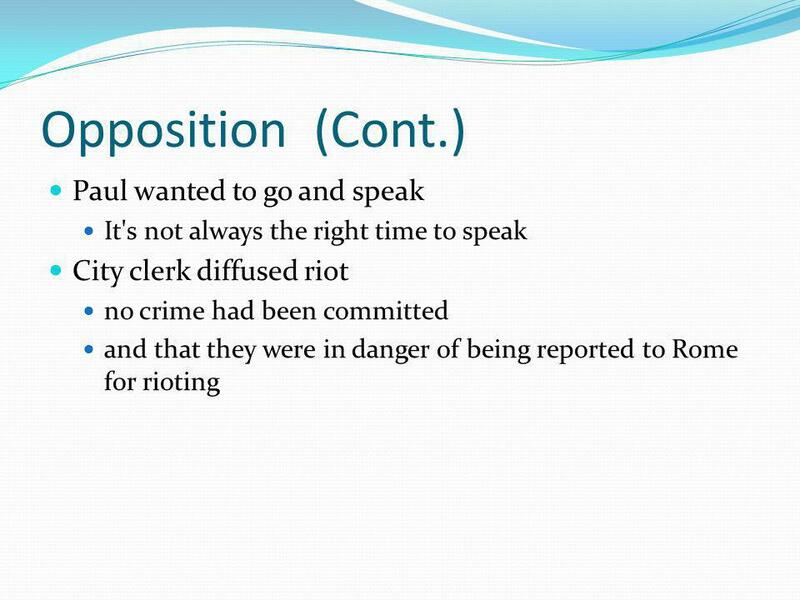 JESUS and AUTHORITY By what authority are you doing these things? they asked. And who gave you authority to do this? – Mark 11:28. But Who are you?. But Who are You? 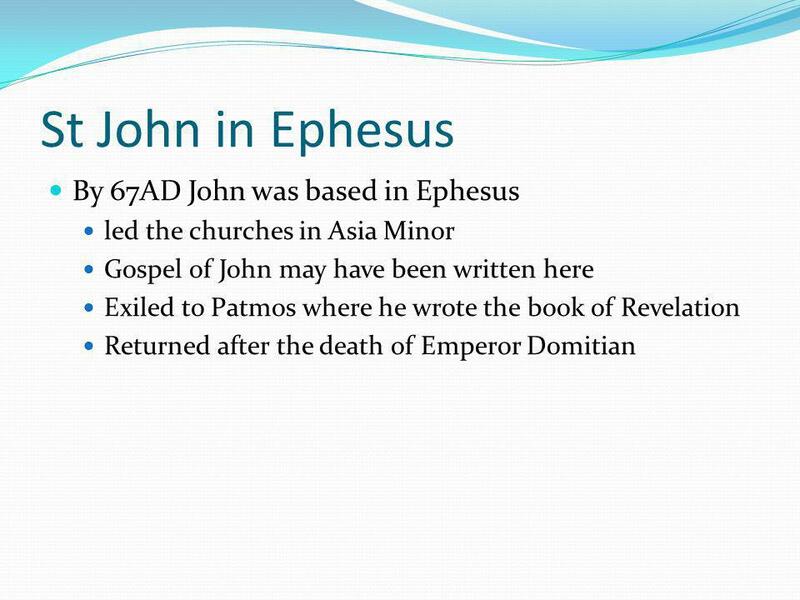 and it happened-SO the word of the Lord grew mightily and prevailed. 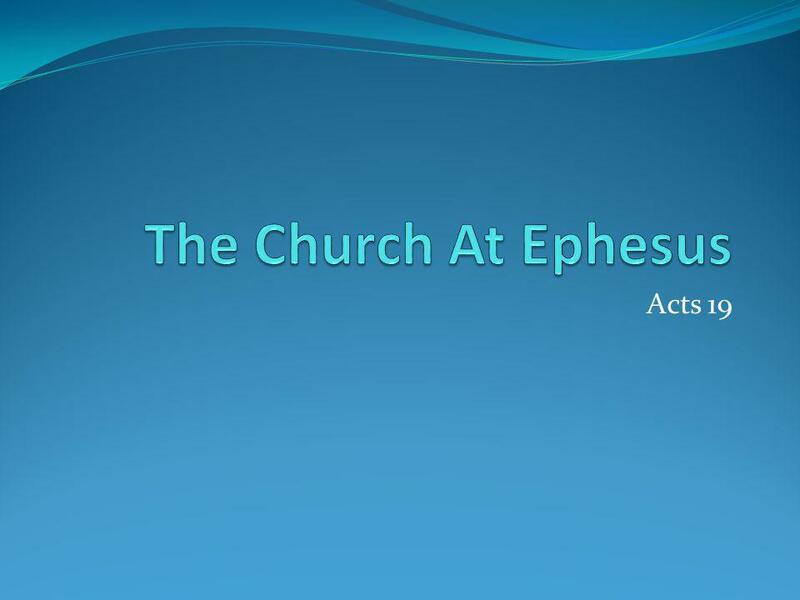 Paul at Ephesus Acts 18:23-19:20 Message 9 in our 9-part series on the Acts of the Apostles. 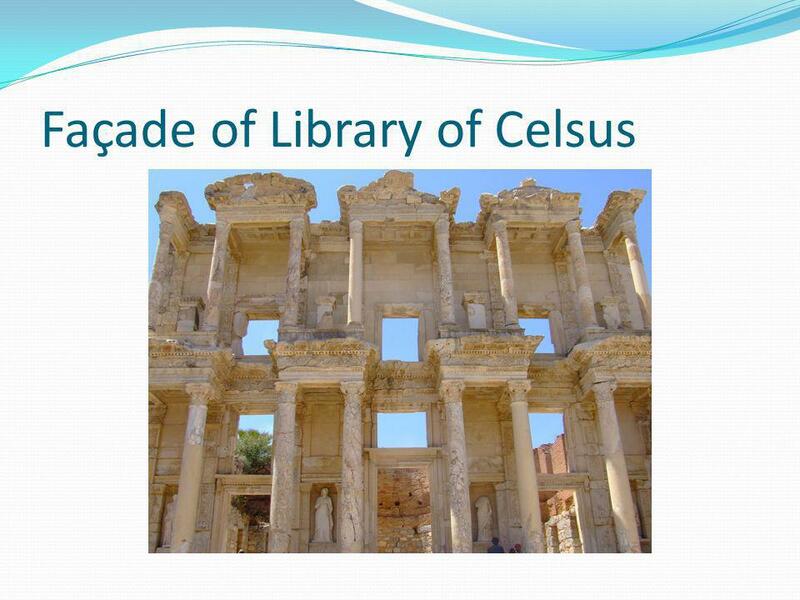 Sunday, June 29, 2014 Speaker: Gord Hambly. Tasting the Goodness of the Father 1 Peter 2:1-3. 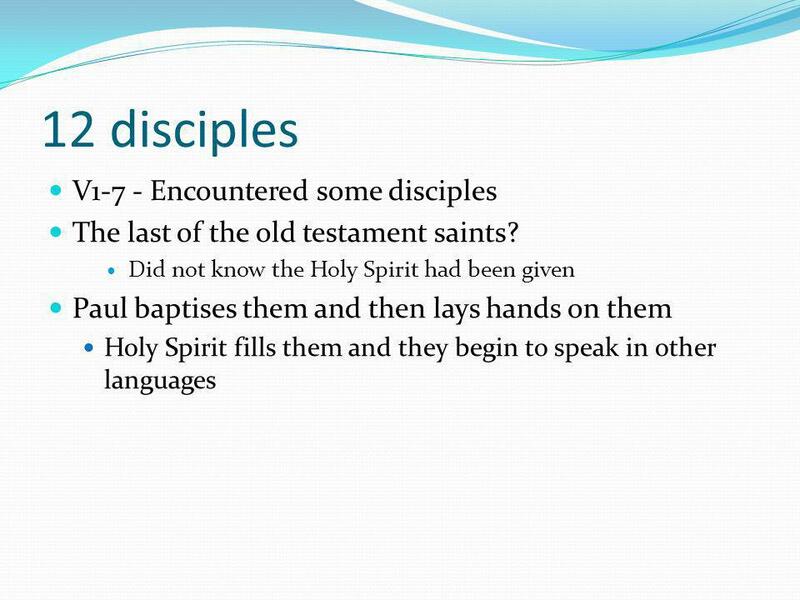 The Holy Spirit “Not Yet Given” A Study of the Giving of the Holy Spirit 1. 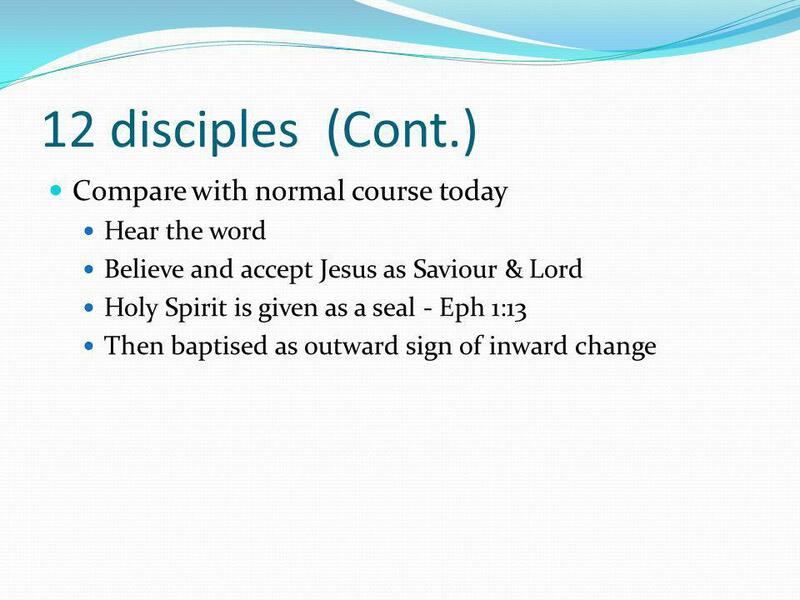 Believer’s Baptism Baptism and Salvation in the Book of Acts.